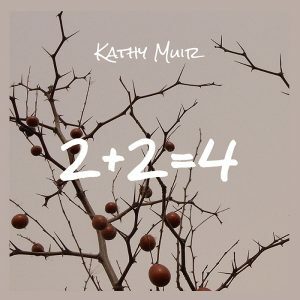 2+2=4, Kathy Muir’s New EP More Than Adds Up. It only takes a brief conversation with Kathy Muir to be struck by the enthusiasm and dedication she brings to the art of song writing. The recent release of her new EP, “2+2=4”, sees her continue to impress. Her voice, always warm and compelling, has never sounded better as she utilises her own strengths to maximum effect. Trying to categorise Kathy Muir can prove to be a fruitless exercise. Her mix of Americana, jazz, blues and folk coupled with her thoughtful lyrics suggest an artist that is entirely comfortable with her own singular path. Perhaps that is due in part to the more unusual route she has followed to a recording career. Born and raised in Edinburgh, Kathy Muir had what some might call a ‘proper’ job for a number of years. It would be easy to label her current musical pursuits as a second career but it would be wildly inaccurate for Kathy Muir had been writing songs long before entering a studio proper. In August 2011 Kathy Muir was enduring one of those long airport waits whilst contemplating a two week business trip to the states. An inspired google search for recording studios in Stamford, Connecticut, threw up three results. The first two failed to pick up her call, the third was answered by Steve Hansen at Hi-Top productions. It was the start of what has proved to be a fruitful collaboration. The new four track EP marks another distinct step forward for the artist. As always the songs are extremely well crafted. Opener ‘The Other Side’ tackles intolerance but for Muir it is hope rather than despair that is the winner. ‘River Running’ is possibly the catchiest track, the chorus proving to be a real ear worm. On ‘Try Coming Round’ optimism and cynicism meet head on in an imagined conversation. 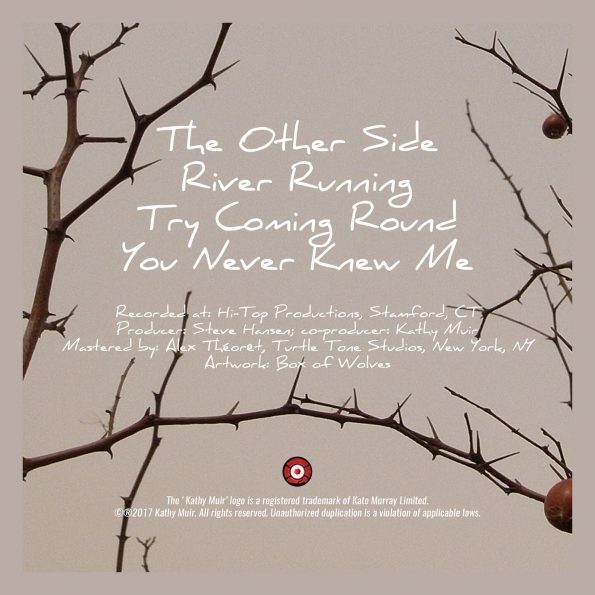 Final track ‘You Never Knew Me’ is one of the more stripped down songs here. Kathy Muir’s warm vocal set against a simply strummed guitar reflects on just how we are seen in this world as individuals. It’s a comforting dream like track, evocative of those early morning reflections we all engage in occasionally. So far Kathy Muir has played only a handful of gigs in her home country. That should change next year as she explains. “Assuming everything fits in to place I’m hoping to return to Scotland early next year and settle back in Edinburgh. I’m looking forward to getting in to the art and music scene in Edinburgh which I follow avidly from afar.” It’s a homecoming to look forward to. You can buy/listen to 2+2=4 here.